Ready or not, boating season is coming. Is your vessel ready? Be sure to take your boat out for a quick sea trial before the season gets into full swing, to catch any potential trouble spots. We have made a number of extended trips throughout the Northwest without significant mechanical or electrical problems, unlike too many other boat owners, but our trouble-free cruising has not come without extensive effort to make our aging 381 Meridian ready to go each spring. Over the years I have developed an extensive checklist that covers all key systems, from the keel to the anchor light. I do it all myself and then call for a professional review. For example, a check of the DC electrical system should include testing the battery load, checking the wet-cell fluid level, cleaning battery terminals, testing circuit breaker panel circuits, and checking lights, blowers, horn, pumps, electronic gear, and navigation and anchor lights for proper operation. If one battery fails a load test, all the batteries in its bank should be replaced. Are there spares for all the lights on board? Similar testing is required for the AC system. Is the shore power cord OK? Are the contacts burned or corroded? Do I have a spare? I service and operate the generator and confirm it preforms to specifications under load. Then I operate all major AC appliances, including the water heater, space heaters, refrigerator, freezer, ice-maker, inverter and battery chargers; test GFIC receptacles in the galley, heads and in the deck locker; and make sure I have a variety of shore-power cord adapters (15-, 20- and 50-amp plugs). Plumbing is next on my list. I check the through-hull valves for easy, leak-free operation. Are hoses and clamps OK? I check ’em and then test all the automatic bilge pumps, give the manual pump a workout and make sure the bilge pump warning lights at the helm are working. Is the freshwater pressure system working? Is there a spare pump aboard? Is it time to change filters? Also, I clean the water tank. Don’t forget the wastewater “Y” valves. Make sure they work smoothly. Look for leaks and lubricate as required. If wastewater hoses are more than seven or eight years old, their time may be up. Consider replacement. Brace yourself and investigate the holding tank and the macerator, and clean the shower sump-pump filter. Flush the system with fresh water and be certain the pumps are pushing water overboard. Check the spares locker for repair kits. Easy Goin’ has hydraulic steering, trim tabs and thrusters. I meticulously inspect the hoses for leaks, lube the rudder linkage and ensure the fluid reservoirs are filled. Cummins diesels — including fresh oil and filters — and change the fuel filters, replace absorbent pads in the bilge and check for f luid leaks. I make sure all engine alarms are working and that the instruments at the helm provide accurate information. Next, I check all hoses and clamps, shaft couplings and seals. I watch the exhaust for proper water flow and for unusual smoke that might indicate the need for injector service or valve latching adjustment. Other checks include the drive belt’s condition and tension, inspecting and cleaning spark arresters, and ensuring the engine mounts and drive coupling nuts are tight. Overheating will stop a diesel quickly, so open and clean the seawater strainers and replace the strainer gasket. Replace the seawater pump impeller, and open and inspect heat exchangers and remove debris. If the tubes are plugged, send it off to a shop for chemical cleaning. With a handheld infrared thermometer, check operating temperatures. Our spares locker includes several general parts, a macerator, duckbills for the head, hoses, belts, impellers, fuses, filters, etc. I ensure at least the basic tools are stowed on board. The cruising routes to northern Canada and southeastern Alaska have no parts stores, so boat owners need to be prepared to handle any breakdowns. I operate by a simple philosophy: If I have the spares aboard, I won’t need them, but if I don’t have them, I will have a breakdown. Easy Goin’ has a hydronic diesel furnace, so I check for fuel and fluid leaks, replace fuel and fluid filters and ensure the expansion tank has the proper fluid level. all of the PFDs in good condition and CO2 cartridges charged? Are the flares past their expiration date? Do the fire extinguishers need to be serviced or replaced? Is the first aid kit well stocked and free of expired items? 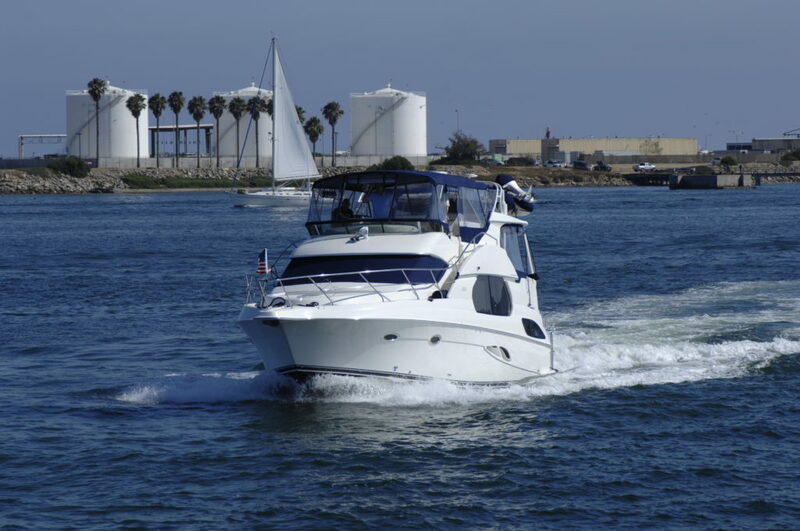 A sea trial is important, particularly to be sure the engines are running smoothly. I like to schedule a short spring cruise after completing my boat check and maintenance work. I operate every system, from the windshield wipers to the diesel furnace and navigational systems. If it all holds together for several days, I’m confident my longer cruises will be uneventful. Take a walk around the boat. Are mooring lines frayed? Does the anchor windlass work? Do you have a spare deck switch for the windlass motor? Does the anchor rode need new depth markings? Is the deck hardware tight, especially the rail stanchions and cleats? How about the windshield wiper blades? Time to replace them? Test the dinghy hoist. The best way is to put the dinghy in the water on that spring sea trial, if it’s not possible in the marina. Got propane aboard? Are the tanks firmly mounted and rust free? Is the certification on the tank outdated? Is the enclosure properly vented? Fill the tanks, too. How about the dinghy? Does it still hold air? Where’s the patch kit? Does the outboard motor need servicing? Get rid of the old gas in its tank. You want the boat to come home looking good, too. Get out the fiberglass cleaner/polish and, if you have exterior teak, find time for the sandpaper-varnish routine.